Dale Pro Audio, in collaboration with the Peter E. Schmitt Company, presented the "House of Worship Audio Workshop" on April 8 and 9. The workshop was a free training event that focused on audio and technology solutions as well as practical tips for the house of worship market. 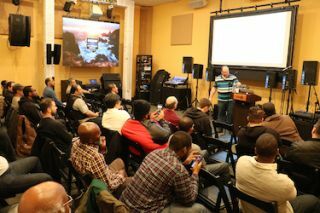 The event took place at Dale Pro Audio's Queens, NY location, and focused on the needs of pastors, worship leaders, music directors, audio technicians, engineers, and anyone interested in learning how technology could enhance their worship services. Special guest speakers included Brad Duryea (director of audio technologies, Lakewood Church, Joel Osteen Pastor) and Michael Moore, CTS-I (market development, Shure Incorporated). A panel of industry experts took attendee questions and featured a spirited discussion of the challenges facing worship facilities today. A wide range of topics were covered such as microphone applications for modern worship, the future of wireless and RF spectrum, assisted listening, proper monitoring, mic techniques for drums, bands, and choir, recording worship services, and portable PA solutions. In addition to the workshops, QSC and Shure provided giveaways of TouchMix-8 Digital Mixers and SE535-CL Sound Isolating Earphones. "We are proud to partner with our good friends at the Peter E. Schmitt Co. to provide an informative and solutions oriented event for our customers" said Dale Pro Audio co-owner, Valerie Lager. "The house of worship market is an important and growing segment of our customer base, and we feel that Dale's experience and seasoned sales and support staff uniquely positions us to serve this community well."